We love hosting events. 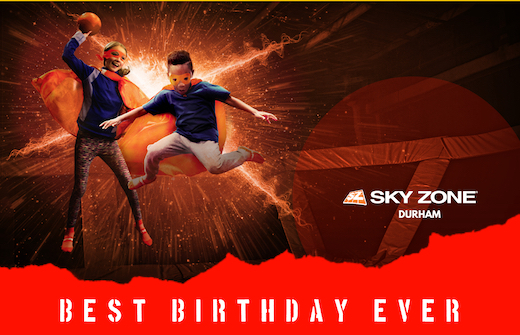 From birthdays to corporate team building, we will make your day soar. We offer facility rentals with full staff support and comfortable meeting rooms. Follow this link to submit an inquiry and we will help you plan a perfect event. •Waivers are required for all jumpers. Jumpers under 18 must have a signature by their parent or legal guardian. Fill out a waiver before arriving. Please arrive 30 minutes early to ensure timely check-in. •Sky Zone monitors reserve the right to separate participants by size for safety, and Ultimate Dodgeball cannot be guaranteed. •Walk-ins welcome but court capacities are limited and hours are subject to change. Business Hours: M-Th, 10am-9pm; F-Sa, 10am-10pm; Su, Noon-7pm Exclusive Toddler Time: W & Sa, 9am-10am. Wheelchair/Disabled Access Comments: Elevator is available for guests with managerial assistance. Comments Regarding Groups: Open daily for special events and group outings. Call 919-425-0800 for reservations. Scheduling Policy: You may book tickets online, however, for groups of 15+ jumpers we do suggest arranging a group jump time with our Event Assistants by calling 919-425-0800. Tour Type: Informational regarding park operations. Space Notes: We can have up to 151 jumpers at one time, building capacity is 500 people. Picnic bench style tables in the room, can be re arranged to accommodate larger groups. Can add tables and chairs to the space if needed.